The exponential growth of infrastructure and data that accompanies digital transformation has put new demands on enterprise IT, leading many organizations to adopt methodologies such as agile and DevOps and shift from silos to more centralized management structures. A dual horizontal and vertical focus on the complete business service is what will set a modern IT environment apart from the competition and promote a better end-user experience. The need for end-to-end monitoring has become evident. 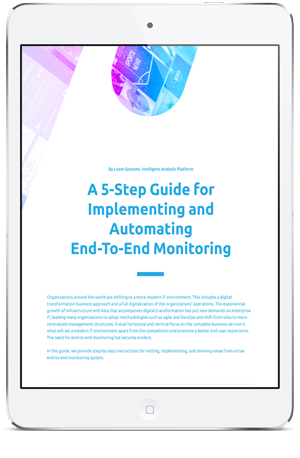 In this guide, we provide step-by-step instructions for vetting, implementing, and deriving value from a true end-to-end monitoring system.